Who may access the Bissell Library and its resources? Currently enrolled students of ACT, Anatolia College and the International Baccalaureate School, alumni of ACT and Anatolia College, current faculty and staff of ACT / Anatolia College / Anatolia Elementary School, and public members. Go to the ACT New Building Reception Desk with a recent passport sized photograph and your 8-digit ID number. Submit a recent passport size photograph at the time of your application and collect your ID card from the ACT New Building Reception Desk. Take your valid ID card / 8-digit ID number to the Bissell Library Hub and provide a contact phone number and a regularly checked non-ACT Gmail email address. Then we will create an Anatolia Libraries borrowing account for you. Can I use a computer in the Bissell Library Lab (Lab 7 / Room 211)? Yes, but only if it is free and not being used for class instruction. You will need to leave if a class is scheduled to begin. Does the Bissell Library provide wheelchair access? All areas of the Bissell Library are accessible to individuals in wheelchairs. An elevator provides access to all three levels of the building. Both B&W and color printouts and photocopies can be made using the self-service procedure (for help getting started please ask at the Bissell Library Hub). Where can I find the printer? It is in the Copy Room (Room 109), Bissell Library lower level. Yes (please ask at the Library Hub). How much does it cost to make printouts.photocopies? 0.05 Euro cents per B&W printed side. 0.25 Euro cents per color printed side. How much does it cost to make scans? Self-service using the Room 109 printer: charge is the same as for printouts/photocopies. Library Hub scanning by Library staff : 0,50 Euro cents per scanned page. How do I pay for printouts / photocopies? How do I make printouts? I don't have ACT credentials. Can I still make printouts/photocopies? Library staff can assist you with your printouts/photocopies. Payment can be made at the Bissell Library Hub. What kind of help can I get from the Learning Hub staff? Study skills (the writing process, paraphrasing / summarizing / note taking, critical thinking, time management, presentation skills, avoiding plagiarism, research paper and thesis writing, math and chemistry skills). Digital skills (Moodle, social media, digital citizenship, digital storytelling, blogging, podcasts and podcasting, ebooks, MOOCs, i0S / Android / Google apps). Where is the Learning Hub? 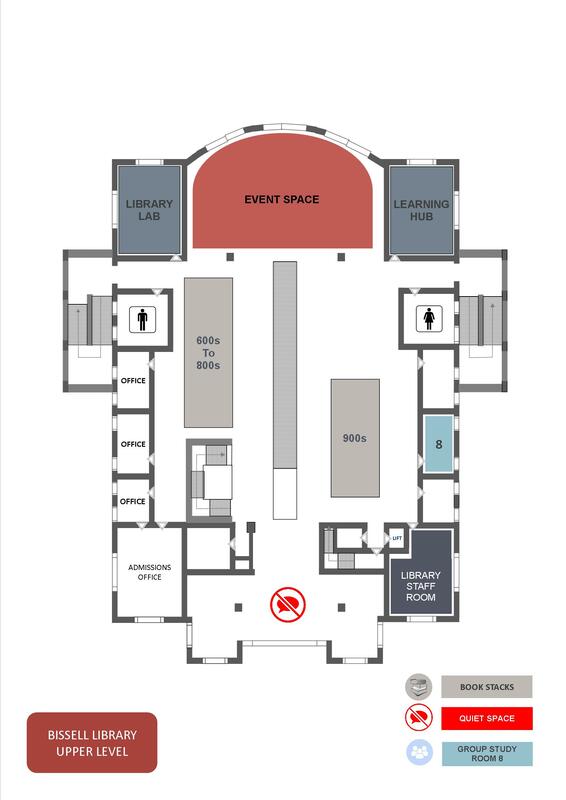 It is Room 209 (on the Bissell Library upper level in the east wing corner at the back of the building). Where can I get more information or meet a member of the Learning Hub staff? Please check the online schedule for the current operating hours. Then you can either make an appointment (writingcenter@act.edu ; +30 (2310) 398-223) or simply drop in. Are drinks allowed in the Bissell Library? Which types of food are allowed in the Bissell Library? Certain food is allowed (pre-packaged snacks such as granola bars, bread sticks, potato chips, pretzels, cookies), but only in the lower level west wing Social Zone. Where can I throw away my garbage? There are recycling containers for plastic (bottles, etc. ), aluminum (cans, etc. ), and paper. These can be found in the library foyer. There are smaller blue general recycling bins throughout the library on both levels. Please use the two bins outside the library foyer for non-recyclable waste. Is smoking permitted anywhere in the Bissell Library building? In compliance with European Union regulations the Bissell Library building is a smoke-free zone. What is the Bissell Library’s noise policy? The Social Zone (in the lower level west wing) where you may socialize. The Group Study Zone (on the lower level at the back of the building) where you may discuss. The Quiet Zone (on the upper level) where you should keep noise to the minimum. Please be considerate of the silence requirements of other library users at all times in all areas of the building. Where can I go to discuss academic related group project work without disturbing other users? The Group Study Rooms (GSRs) are available for this purpose. You may book onehere. Do I need to turn off my cellphone before entering the Bissell Library? No, but please turn your phone or other electronic devices to silent/vibrate mode in order not to disturb others. Can I display a poster, photograph, sign, or notice in the Bissell Library? Display of posters, photographs, signs, and notices may be displayed in designated areas and with approval by the Library staff. Elsewhere they are prohibited. Can I film or photograph within the Bissell Library? Individuals who wish to film or photograph within the Library must first obtain permission from the Anatolia Public Relations Office. Such requests will be accommodated only if there is minimal impact on Library service and its environment. How can I book the Bissell Library Computer Lab for a class (ACT / AC faculty only) ? The Bissell Library Lab (Lab 7 / Room 211) may be booked by faculty for classes via Bissell Library Hub (bissell@act.edu ; +30 (2310) 398-390). Reservations are made on a first-come-first-served basis. I can’t find the answer to my question in these FAQs. Where can I get more help? You may Ask a Librarian for library and research-related questions.